Free Shipping Included! 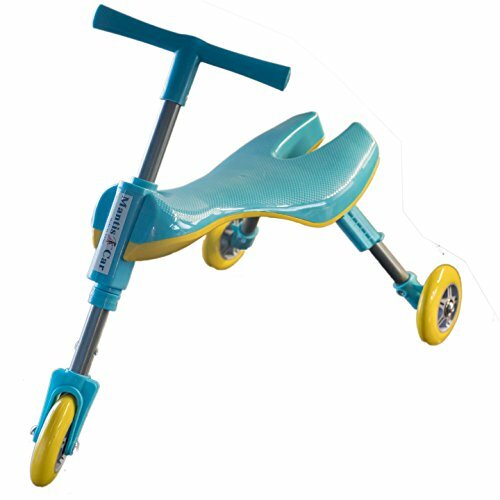 Mr Bigz Foldable Indoor/Outdoor Toddlers Glide Tricycle - No Assembly Required (Blue) by Mr Bigz at Joes V Cycle. MPN: Blue. Hurry! Limited time offer. Offer valid only while supplies last. Setting it apart from most scooters on the market, the compact Fly Bike Foldable Kids Scooter easily folds down for travel purposes and easy storage. Setting it apart from most scooters on the market, the compact Fly Bike Foldable Kids Scooter easily folds down for travel purposes and easy storage. Its portable design makes it perfect for the indoors and outdoors. Your child can ride it inside the house, in the front or back yard, or at the park. A mix between a bicycle and a scooter, the Fly Bike Scooter is ideal for toddlers who are not old enough to ride a regular 2-wheel bicycle. The Fly Bike Scooter features: Foldable and Lightweight: You can store the Fly Bike in any closet, under the bed, or even your car's trunk when traveling. It's small and comfortable size makes it easy to transport. Simply lift the scooter with one hand to move it from one room (or space) to the next. 3-Wheel Design with Seat: Provides great stability - helps young riders build coordination while providing a safe riding experience (compared to 2-wheel scooters that can be unstable and hard to maneuver. A sturdy yet comfortable built-in seat is also included. Independence Early On: The Fly Bike teaches children to balance and steer while using their own feet to push the scooter. No parental assistance is needed. The wheels are designed for a smooth and quiet ride. Ideal for Toddlers: Specifically designed for kids ages 1-4, the Fly Bike is perfect for children who are constantly on the go. I will keep your child occupied while allowing him or her to move in any direction. If you have any questions about this product by Mr Bigz, contact us by completing and submitting the form below. If you are looking for a specif part number, please include it with your message.